I will always and in every way be a fan of Michael Voltaggio. So, in hearing his interview on The Baub Show, I am even more impressed. And, I have never tasted a single bite of his food. I have been in China for 4.5 years. Give me a break. But, he is just greatness. Check out the article and the photos and to listen to the interview, click on this link. 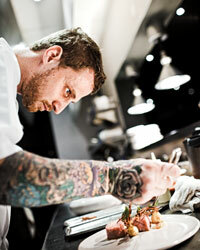 Click here to cast your vote for Michael Voltaggio for best new chef in California – Food and Wine Magazine. He is an amazing and innovative chef. And he is cute, too! Photo by Ed Anderson. Congrats to Chef Voltaggio and ink. -Named #1 Best New Restaurant in America by GQ Magazine. 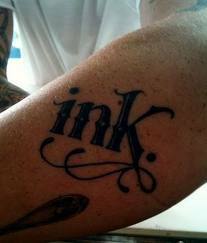 Michael Voltaggio’s, living up to the hype, new restaurant, ink. has garnered another great honor. Even for the too cool for school Voltaggio, this one is pretty awesome. Click the link to read about the LA restaurants newest award. I am sorry, but I had to post this because he is just so HOT!!!! !